Looking in Moose Habitat for Moose? Do You Know Where to look? I continue to learn about moose and moose habitat and yet I have been a successful moose hunter for over twenty years. Let me share with you the moose information of which I have gained knowledge. Moose (Alces alces) inhabit the areas of the world where the four seasons come and go, and with the seasonal change in environment moose change the areas in which they occupy. Specifically I will address moose habitat in areas of British Columbia containing a diversity of ages and styles of logging. I will assume that most of the information I will convey can be applied across the country. In British Columbia, Canada the vast majority of moose inhabit the boreal forested regions with a smaller number scattered throughout the southern sections. There are of course, areas that concentrate moose populations and it is up to you to find these pockets in moose habitat. What I can share with you is where to look in the forested or un-forested zones and the time of year to look. This is great looking moose-habitat, and upon looking around I found lots of moose sign especially near the edges of the openings. The old forest in the background would be a good place to start hunting moose. 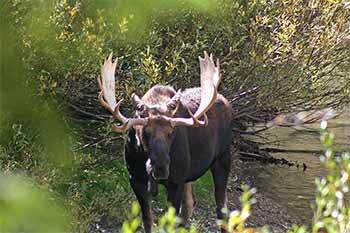 Moose followed a general annual pattern that varied according to the conditions prevalent during individual seasons. In spring, moose were found in open habitats. The spring to summer change of season saw moose move into habitat characterized by heavy forest cover. In fall, moose were again associated with heavy forest covers, perhaps even more so than during summer. Early winter produced a dramatic shift of moose into open habitats. In mid-winter and late winter, moose retreated to habitats with heavy forest cover. My own experiences show that these conclusions are correct. Contrary to popular belief, previously logged areas that are re-planted do not support moose populations. At first (after logging) the browse availability is good and moose will take advantage of these areas in the spring (for a few seasons). Once newly planted trees begin to grow, they very quickly choke out the available browse leaving poor moose habitat. Once this happens moose will not utilize the area. 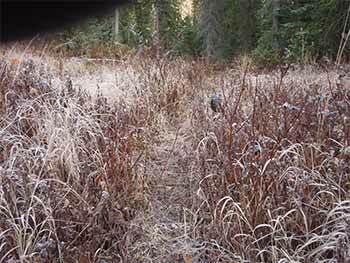 Areas that naturally seed themselves will see more moose utilization for more spring seasons but these too will eventually be abandoned by moose. Check it out for yourself the next time you are out looking for moose. Take a walk though a recent cutblock, the sign left by moose will have been made early in the year. 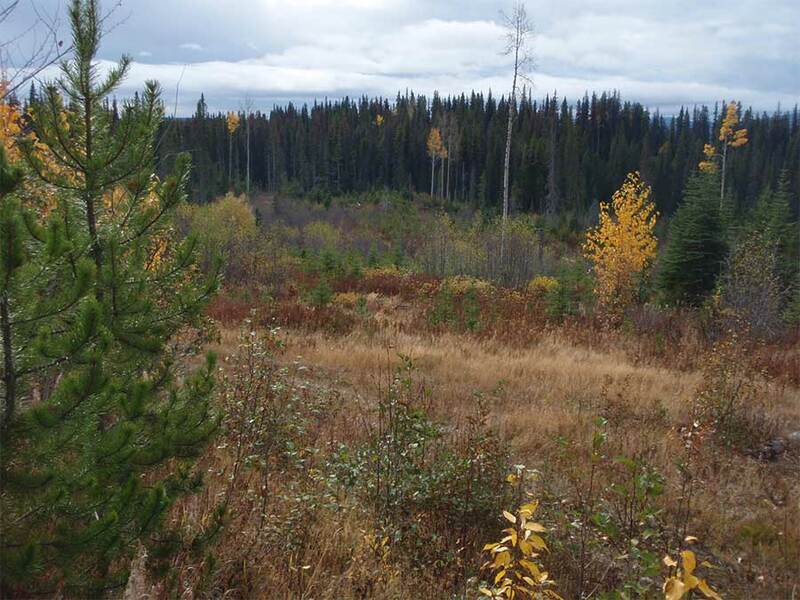 Then look through an area where the trees are 2 – 3 meters in height, a lot less forage and less moose sign. Forest managers would have us believe that 7 -14 years after an area has been logged the block will be good moose habitat. Studies have shown that this is just not the case... I believe the studies. My own experience shows that we seldom see a moose in a growing cutblock. Yes the moose will use these areas in the spring, until the new growth inhibits the nutritional browse growth, after which the moose will not make use of them. When out looking for good habitat, it is always a good idea to carry some sort of a GPS. We suggest the Garmin Oregon 450 as a good mapping GPS to carry to track where you've been and where you are going. Generally speaking, during the fall season you are going to have a much higher success rate of seeing moose if you look in the unlogged areas. This may entail moose calling, still hunting or stand hunting. Finding wetlands that are within or back onto the unlogged areas will be of a good help too. Moose will avoid human contact, if an area is getting a lot of traffic whether it is vehicular or by foot, they will move to areas that are undisturbed. To be consistently successful in harvesting moose you need to find these secluded areas of moose habitat. They have two methods of defense, one is panting and the other is to seek shade. Twenty degrees Celsius or sixty eight degrees Fahrenheit seems to be the temperature that sends moose scurrying for shade; any temperatures above this causes heat stress amongst moose. Cold on the other hand seems to have no effect on moose. Even calf moose have been observed in temperatures as low as minus thirty degrees without seeking the shelter of the forest. If you are moose hunting during unseasonably warm temperatures (over 20 degrees C) be prepared to go deep into the forest to find moose. They will be in the darkest and dampest moose habitat they can find in an effort to stay cool. A well worn trail leading to an old forest, most likely the core area. Do not look just at forage as a gauge of primary moose habitat; moose also need tall mature trees. Finding moose forage is not enough of an indicator that you are going to find moose in an area. Actually the mature tree stand is the first requirement, then, if the forage is available as well, you will have the makings of a prime environment for moose. I have come across many areas that contain good moose forage but if the zone is surrounded by small replanted areas... No moose here! Sure I have seen moose sign here, not much of it, or the sign is from the spring. One of our favourite moose hunting camps sits directly across from a cutblock that was logged in 1998. Now twelve years old it shows great potential to support moose, lots of forage and it is near a wetland... I wish someone would tell the moose. According to the above stated criteria if we hunted here in the spring we would likely find a moose here, unfortunately there is no moose hunting season in the spring. I am in total agreement with the many studies conclude that moose need a diverse habitat. While you are moose hunting in moose habitat in the fall keep all the above points fresh in your mind. Remember: that the moose will retreat into the thick forests to escape heat and they will congregate near a wet area within the forest. In the fall hunt for moose in or near old forests, especially if they back onto small, (<4 ha.) open areas that contain forage. Moose will avoid human interference; therefore you need to separate yourself from the crowded hunting grounds. Take this moose habitat information and store it in your moose hunting tips memory bank.